Today was a good day. And today, also consisted of two slices of pizza, two cheeseburgers & fries. After a fantastically good client preso, J & I were riding a high and decided to celebrate with burgers. And not just any burgers. 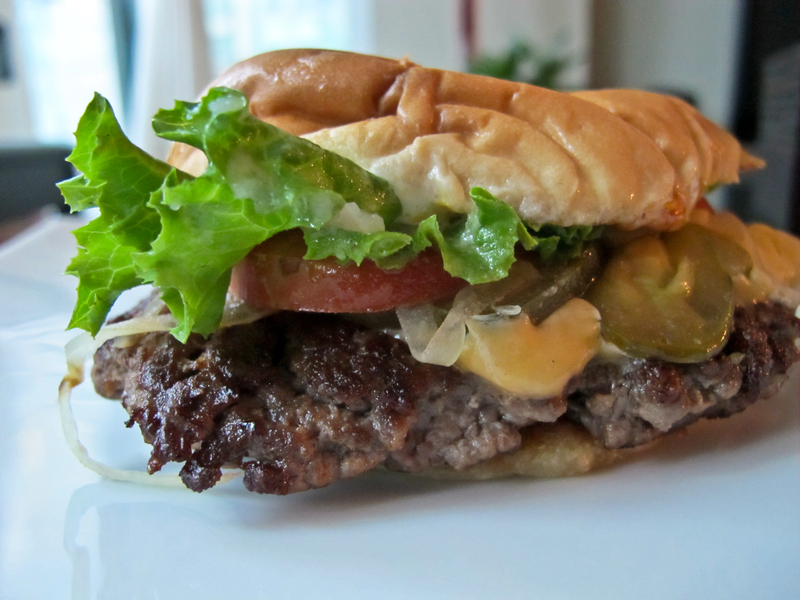 So, there’s been great hoopla & debate over the best burger joint in the city. Will neither confirm or deny, but when a convoy of cars from Church & Bloor make the trek (and I mean, trek) over to the eastest end of Queen & Coxwell for lunch… you know it’s something serious. Crazy agency folks. Would defend, compare and throw opinions around, but 6hrs later, still in a slight food coma and can only focus on one thing at a time. So, singularly-focused this post will be. P.s – will never forgive you guys for not telling me that day. So, this convoy comes back and they rave. Rave about the patties. Rave about the ground beef. Rave about the patty to bun ratio. Rave about how good it is. Rave about how they can’t describe why it’s so good. Rave about possible best burger in the city. So, I make them promise to take me the following week. When that day came, so much anticipation from so much internal hype. And let me tell you… hype FULLY justified. Not disappointed. In the least. Raved to friends, strangers, anyone who would listen. And 6 weeks later, 2nd trek was made. The patties! So fresh. Grounded daily, never frozen. You see ’em grilling, and your tastebuds start to salivate. Buns are buns are buns, but something happens when they meet freshly grilled ground beef. Chemistry! The combination of incredibly soft patties, slightly charred, flanked by two unassuming buns and fixings, if you so desire… kinda fantastic. This eve, honed in on the Combo (cheeseburger, fries & drink) and threw in an extra cheeseburger for the road. Listen, I’m a fat kid at heart. But, not that fat. These burgers are not large. In fact, quite small. However, may have to retract claim after tonight. Deceivingly small. Having eaten two cheeseburgers and 1/4 of the fries (ok fine, 1/2)… not so brilliant on my part. Regrets? Never. You eat, enjoy & digest… yep. Sorry Ma, most unladylike post. As for the pizza, no good story. It was there for taking. So, I ate it. New obsession. Slow-roasting. Garlic. Tomatoes. Frankly, anything we can get our hands on. Surprise! I do in fact, turn on my stove every once & a while. Figured I’d take a break from tales of restaurant gluttony. And regale you with tales in the kitchen. FYI: Best smell in the world is garlic roasting. Someone should really make a candle for it…imagine? L would probably kill me. Recipe (almost) diligently followed from “Cooking for Friends”. Preheat oven to 300F. Lightly oil a rimmed baking sheet. 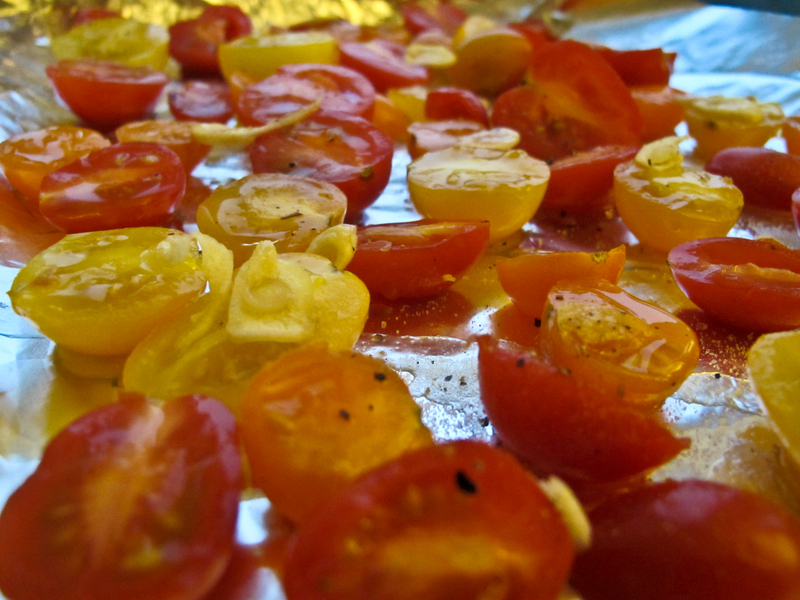 Arrange tomatoes, cut side up, on prepared baking sheet. Drizzle with olive oil and sprinkle evenly with sugar, garlic and generous amounts of salt and pepper. 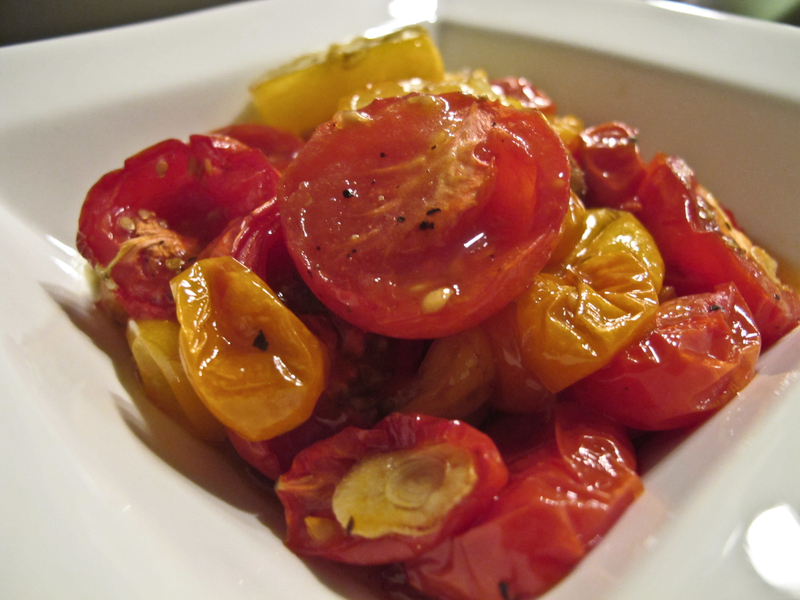 Roast tomatoes until deep red and wrinkled, 2-21/2 hours for medium or plum tomatoes and 1 hour for cherry tomatoes. Remove from oven and let cool on baking sheet. Serve warm or at room temperature. 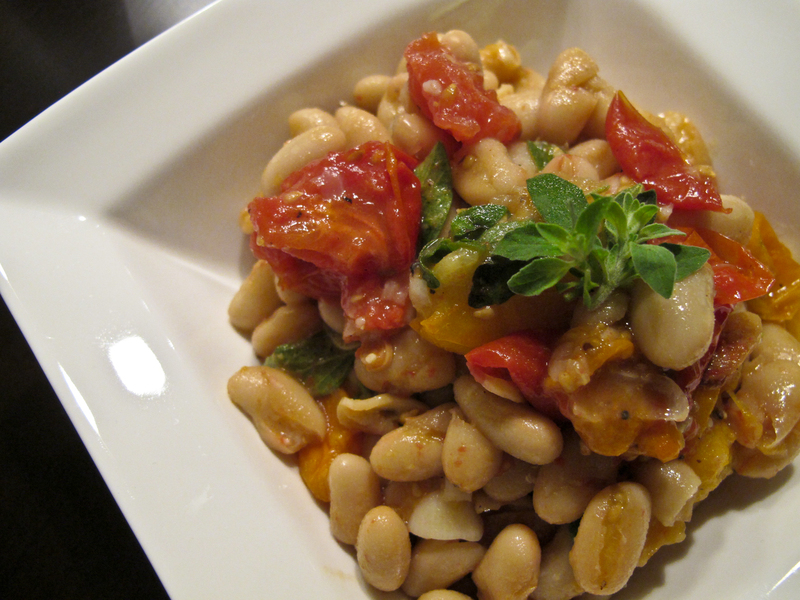 Note: 1 of 12964 slow-roasted tomatoes recipes with 12964 different temperatures / length of time to roast. From 2 hours at 300F, to 7 hours at 225F to 12 hours at 200F….bring it on.